In one of the most famous scenes in sports movie history, Rocky Balboa goes for a run through Philadelphia to prepare for his fight. With ‘Gonna Fly Now’ blaring, Rocky sprints up a set of stairs to finish his workout. At the top of the steps, Rocky turns around, shadow boxes for a few seconds and then raises his hands in victory as he’s mobbed by adoring fans. It’s a classic moment and one that makes the ‘Rocky Steps’ a popular spot for tourists in Philadelphia. The ‘Rocky Steps’ (the name most people refer to them as) are actually 72 stone stairs leading to the entrance of the Philadelphia Museum of Art. I honestly didn’t see one person go in the museum when I was there, but I saw everyone running the ‘Rocky Steps’ and posing with their arms high in the air. My mom and I jumped in on the fun as well. You just have to do it! The ‘Rocky Steps’ are perfect for anyone celebrating the famous scene, but they also provide a great view of Philadelphia (one of the reasons I’m sure the film crew chose that location). When you look back toward the city, you see Eakins Oval, the Benjamin Franklin Parkway, Philadelphia City Hall and the impressive Philadelphia skyline. The Philadelphia Museum of Art is a cool looking building as well. The original ‘Rocky Steps’ scene was so popular that the filmmakers wound up using it in every movie in the series (there were six different Rocky films). 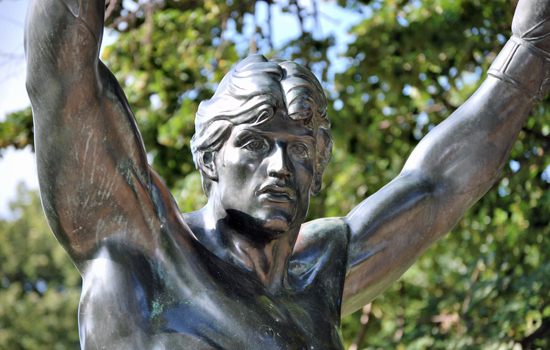 Before Rocky III, Sylvester Stallone commissioned a sculptor to create a large bronze statue of Rocky. The statue was placed at the top of the stairs for the movie, but it was eventually taken down and moved to a grassy area next to the ‘Rocky Steps’. The statue is still there today, and it’s popular with tourists as well. In place of the statue at the top of the ‘Rocky Steps’, you can now find a set of bronze footprints with the name “Rocky” over them. It’s a little unusual (since the original Rocky was released in 1976), but the ‘Rocky Steps’ are one of Philadelphia’s biggest tourist attractions. Thousands of people from all over the world, young and old, run up the ‘Rocky Steps’ every year. Unless you’re a Rocky freak, the stairs alone aren’t reason enough to visit Philadelphia, but if you ever find yourself in the City of Brotherly Love — run baby, run! Have you ever been to the ‘Rocky Steps’? What was your experience like? We would love to hear all about it! Please leave a comment below or connect with us on Facebook, Twitter and Google+. Don’t forget to also check out Seattle Bloggers for more awesome places to experience in the Emerald City and around the world!